JPMorgan Chase's board cut its CEO's 2012 bonus by more than half. JPMorgan Chase slashed CEO Jamie Dimon's bonus by 53%, citing the fallout from the bank's so-called London Whale trading losses. Dimon will take home $11.5 million, including a $10 million bonus. Last year, he was the best paid bank CEO with a $23.1 million pay package that included a $21.5 million bonus. JPMorgan's board also decided to push back Dimon's eligibility to sell $79 million of JPMorgan's stock for 18 months. Roughly 2 million shares were eligible for vesting on Jan. 22. "As Chief Executive Officer, Mr. Dimon bears ultimate responsibility for the failures that led to the losses in CIO and has accepted responsibility for such failures," the board said in regulatory filing. At the same time, the board also noted that JPMorgan has reported record profits for three consecutive years and praised what they called Dimon's forceful response to the trading problems. Related: Why is JPMorgan's board unchanged? JPMorgan reported fourth-quarter net income of $5.7 billion, or $1.39 a share, beating forecasts, while revenue of $24.4 billion was in line with estimates. The bank's strong results were driven by a sharp uptick in new mortgages, with mortgage originations increasing 33% year-over year. Fees from mortgages jumped 181% from the prior year. While the housing recovery is underway, Dimon said on an analyst call that he expects mortgage revenue to bounce around over the next several quarters. Revenues in all of the bank's business line, including investment banking and consumer banking, increased from last year. Investment banking fees jumped 52% in the fourth quarter. JPMorgan reduced its staff by 1,500, or roughly 0.5%, to end the year with 258,965 employees. Even with the cuts, compensation expenses jumped 12% from the prior year. Still, investors weren't thrilled by the bank's results. Shares of JPMorgan Chase (JPM) straddled the breakeven line Wednesday. So far this year, the bank's stock has gained more than 5%, after rallying 35% in 2012. Going forward, Dimon said JPMorgan expects to buy back less stock in the coming quarters to shore up its capital reserves. The bank still plans to buy back up to $3 billion of stock during the current quarter, but will ask regulators for permission to repurchase fewer shares after that. Since the financial crisis, the largest banks have been required to prove to the Federal Reserve that they have sufficient capital reserves to withstand another financial crisis. DImon said that the bank will spend this year building up its reserve related to international regulatory guidelines known as Basel III. JPMorgan managed to generate profits during each quarter of 2012, despite recording a $6.2 billion loss from the so-called London Whale trade -- the massive bet on credit derivatives made by one of the bank's London units that went terribly wrong. Since the trading losses were revealed, JPMorgan has shaken up its executive ranks and appointed a new chief financial officer. The bank has also fired executives and traders responsible for the losses and has said that their pay is subject to clawbacks. In October, the bank filed suit against Javier Martin-Artajo, the former boss of Bruno Iksil, the trader who made the bad bets and came to be known as the "London Whale." A source familiar with the case said Wednesday that the suit had been settled, with Martin-Artajo agreeing to return some of his pay via the clawback mechanism in his contract. Martin-Artajo could not be reached for comment. The news was reported earlier by Reuters. The fallout from the London Whale continued this week, when the Federal Reserve and the Office of the Comptroller of the Currency ordered JPMorgan to improve its risk management procedures. In November, the bank said other agencies -- including the Department of Justice and the Securities and Exchange Commission -- were also investigating the matter. 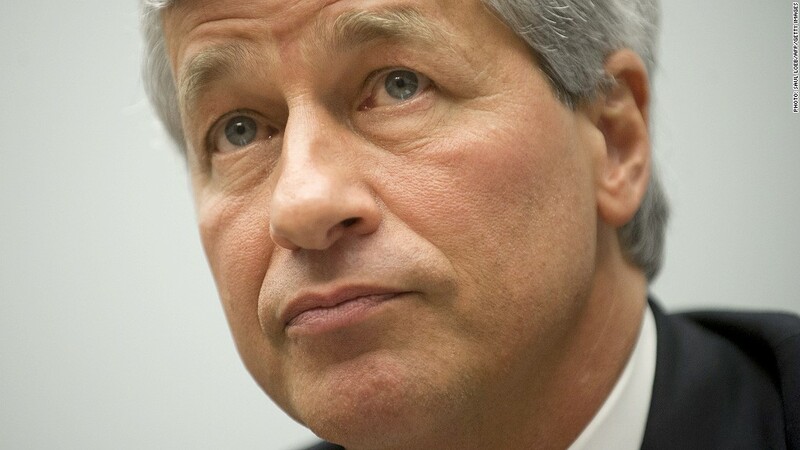 On a call with journalists early Wednesday, Dimon said he expects it to be "non-issue" very soon. "We're getting near the end of it," he said. JPMorgan is the second major bank to report earnings. Wells Fargo (WFC) kicked off bank earnings season last Friday and Goldman Sachs (GS) reported fourth-quuarter profits that topped expectations early Wednesday. Bank of America (BAC) and Citigroup (C) will release results Thursday morning, and Morgan Stanley (MS) reports early Friday.